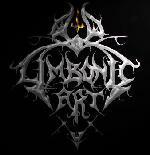 Limbonic Art have released some awesome albums. "Moon in the Scorpio" was excellent, and "In Abhorrence Dementia" was even better; atmospheric black metal with well-done instrumental passages, interesting rhythm changes and killer riffs. In fact, "In Abhorrence Dementia" ranks among my personal all-time top of black metal albums. During an interview (elsewhere in W3M3) Morfeus said that the next album would be a bit different, perhaps a bit more industrial. There is good news and there is bad news. The good news is that the album has not moved into the industrial genre. The bad news is that, regardless of the previous, it's an uninspired effort. "Ad Noctum" is filled, from the beginning to the end, with really intense black metal. There are a lot more vocals (there are more lyrics to sing, the booklet is full of 'em) and there are more drums. Throughout the album the speed seems to be at about 200 BPM, with a few exceptions. Gone are the symphonic interludes, gone are the killer riffs and the awesome rhythm changes. Having listened to the album several times I have to admit that none of the tracks stand out, none of the tracks are memorable. This is one album that will not be in my CD player often. A waste of money.